Edibility – 4/5 – I would give them a 5, but some are likely to find their acidity too much, and some people find there is something in the smell that reminds them of baby sick! Its mostly about the juice, but the leaves also make a decent, healthy tea. Identification – 4/5 – A large shrub or occasionally more like a small tree. 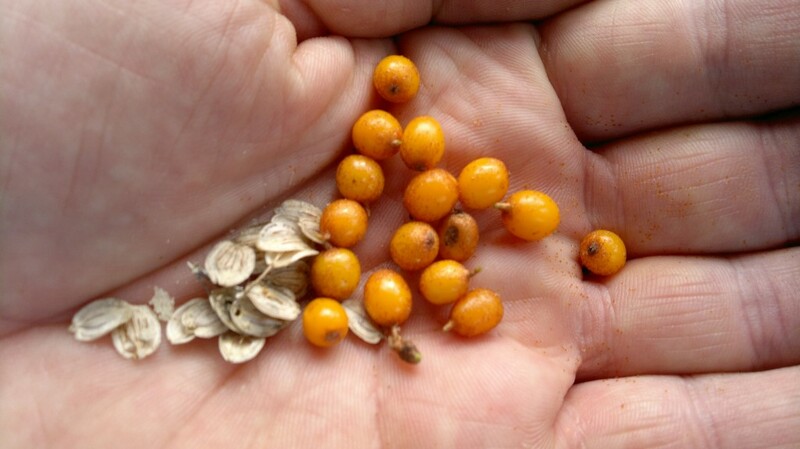 The bright orange berries are very distinctive, as are the shimmering silvery leaves, which are elongated oval in shape. Distribution – 4/5– Abundant (occasionally considered invasive) where established. I only know of a few scattered locations around Dumfries and Galloway, but there is tons of the stuff in other coastal areas. Season – Fruits mature around September, often persisting on the tree well into the next year. Habitat – Mostly coastal, or inland on sandy soils, dune edges etc. Now being planted on embankments, in gardens etc. This is the most striking and delicious of all our UK berries in my opinion – once you get over their nose-scrunching acidity! 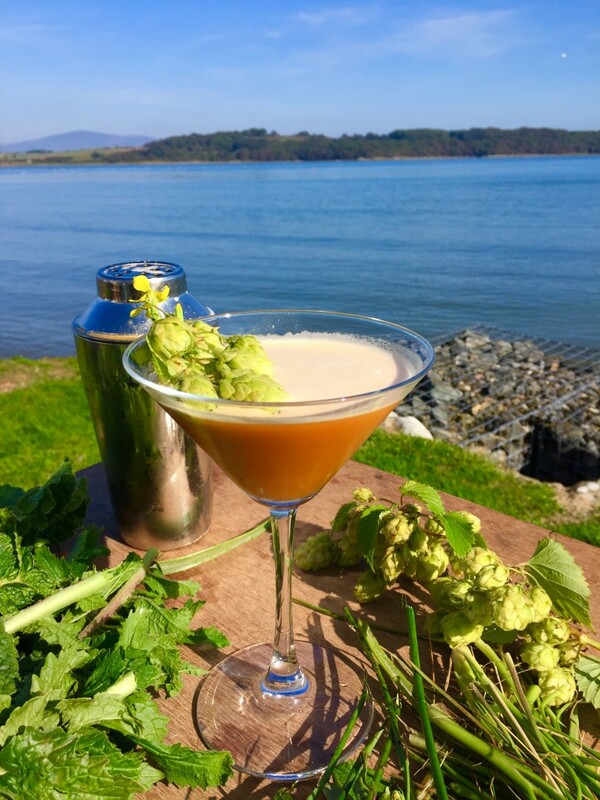 They are exceptionally good for you, being rammed with antioxidants and vitamin C. They are mostly found coastally, but are starting to be introduced – or introducing themselves – to more inland locations. As you recalibrate your senses to the sharpness, you should be able to enjoy the wonderful vibrancy of the flavour – which gets the whole mouth dancing…especially if you chew a hogweed seed at the same time! The berries look like the easiest harvest you could imagine, but are essentially fragile balloons, desperate to squirt their acidic innards in your eye at the merest touch. Sea buckthorn aficionados fall into 2 camps: milkers and freezers. Milkers don souwesters, goggles and very thick gloves and “milk” the berried twigs into buckets. Freezers (like me) selectively prune the best twigs, take them home, freeze them, then collect the berries cleanly and easily. If done mindfully, spreading your pruning around, this has negligible effect on the plant or ecosystem – in fact it often improves growth. 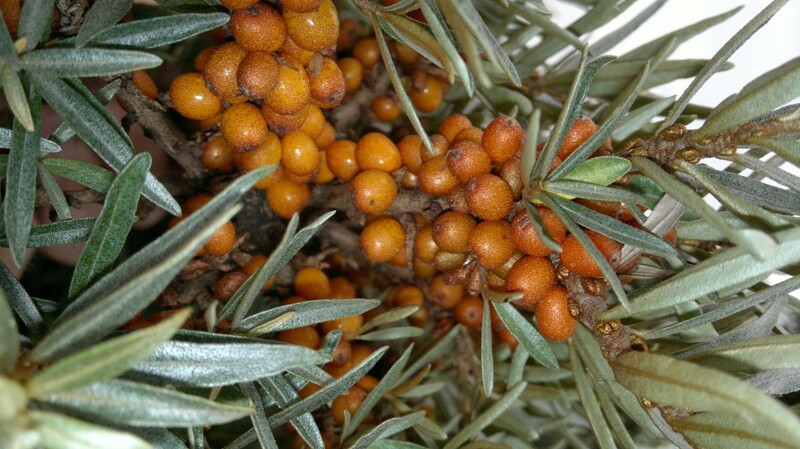 Some people and organisations at some locations, consider sea buckthorn to be a problem invasive, so you may well be thanked for vigorously pruning it. 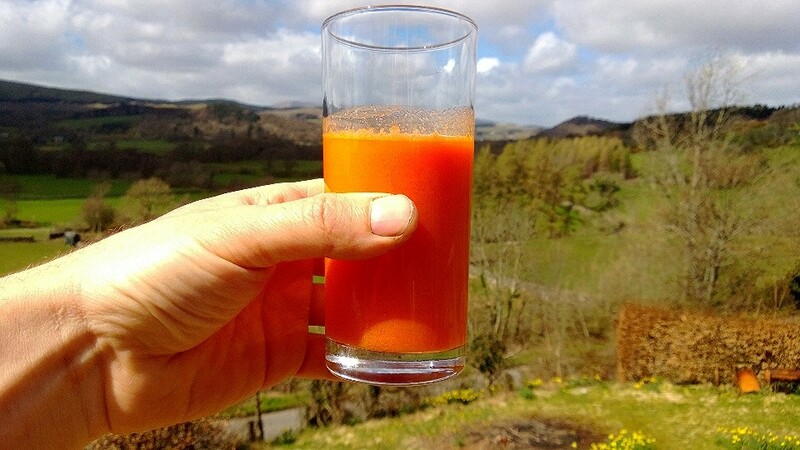 Not just colour sympathy – sea buckthorn juice with carrot juice is one of the finest, tastiest health drinks. Add a squirt of hogweed seed bitters to really set it off. Its always entertaining to look back over old blogs. I wrote this in a very early instalment of my wild food journey. I haven’t found much more in Galloway since then, but have become quite adapt at incorporating visits to sea buckthorn-heavy bits of coast when i’m scooting about the country. 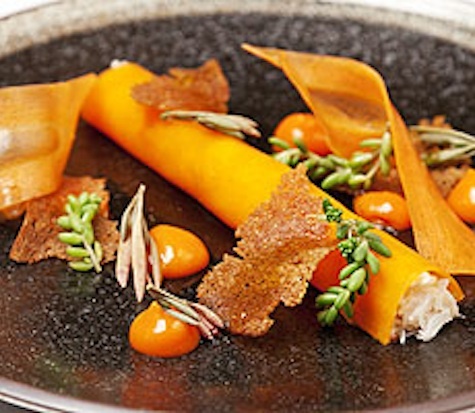 Chefs often pair sea buckthorn with white chocolate in desserts. The berries make an excellent jelly with crab apples and a judicious amount of sugar. I once spent a weekend clearing sea buckthorn from Merthyr Mawr dunes, to the south of Bridgend in the Vale of Glamorgan, where it’s considered an invasive species. It wasn’t until years later that I realised that the berries were edible (no-one on the BTCV weekend had mentioned this) when I came across Sea Buckthorn icecream, in Harlech. Hi there, I just made my first batch of Elderberry vinegar and it’s wonderful!!!!!!!!!!!!! I was wondering if you could achieve similar results with sea buckthorn. What do you think ???? Glad you like it! Sure, have a go with SB. It is much more acidic and i’m not sure the flavour would work in the same way – but you never know until you try – could be amazing! THe seeds propagate well and I’m considering importing to my Shetland garden. Might it be a terribly mistake???!! ps have you got a good recipe for elderflower champagne? most of the recipes I see are for cordial. which is all very well, but…. How can I grow it in my garden. Have seen what very much looks like buckthorn in my local park which is inland, nowhere near the sea. Only thing that puts me off trying is that I don’t see evidence of the thorns on the bush. Is this usual? Are there lookalikes out there? Some variants are less thorny than others. I’m not aware of any other plants that share the elongated silvery leaves and bright orange fruits clinging to twigs. There is plenty of SB inland, even though it does best coastally. 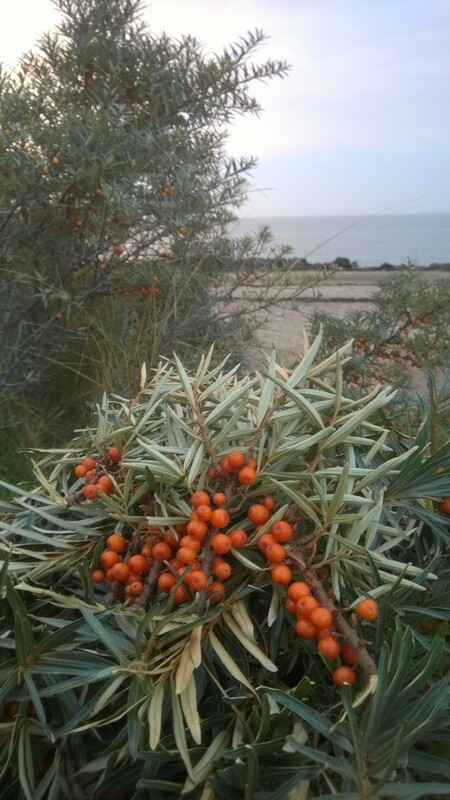 I think this is not sea buckthorn, might be a cotoneaster. I remember being gobsmacked at seeing a row of the most abundantly laden sea buckthorns (I thought) I’d ever seen, when on a jaunt along the Leeds canal. When I got closer I realised the berries and branching structure were very similar, but the leaves were different. I tried a berry and it was very powdery, with no tang (cotoneasters are mildly toxic but are generally so unpalatable that poisonings are very rare), so defs was not SB. I think with no thorns at all it can’t be SB.